Andy H: A cracking selection of comics this week. 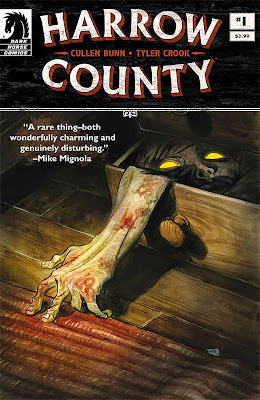 Really looking forward to checking out Harrow County #1 from Dark Horse. I've been enjoying some of the darker titles on offer recently; Wytches, No Mercy and Terminal Hero are great examples. Harrow County looks like it should fit (un)comfortably with these books. Tyler Crook's art really captures the creepy feel and writer Cullen Bunn has delivered the goods repeatedly, so creatively this ticks all the boxes. The story focuses on Emmy - she's aware of the things in the woods surrounding her home but discovers a connection on the eve of her 18th birthday. Ooooh! Also new this week is Lantern City #1 from BOOM! Studios. When I read the blurb for this, something sounded a little familiar; lower classes living in the bowels of a city, kept in check by the Guard, surrounded by high blocks where the rich live above them. Mega City One, anybody? This comparison is not unkind and I'm happily on board as this 12-part series is more steampunk in tone. Jason Aaron and Russell Dauterman have been doing a cracking job on Thor. The story has been moving along at a good pace and the whole 'Who is Thor?' has never had the feeling of being dragged out, but now the wait is over. Yes, issue #8 reveals just who is worthy enough to be the Thunder God. We've all had a guess, who will be right? Plus there's the conclusion of Thor's battle with the Destroyer! Savior #1 did just enough to get me coming back for #2. It was a real slow burner but the last few pages had a big impact and I need to know what happens next. Of course the fantastic art of Clayton Crain means it doesn't hurt to have a second look. I was really surprised at how much I enjoyed Secret Wars #1 so I'm excited by this weeks Secret Wars #2. Where issue #1 felt more like a lead into the event, #2 will hopefully introduce us to Battleworld. Still unsure about the many, many spin-offs coming out but I'll definitely be picking up this miniseries. I can't end this without something new from Image and what do you know? There are two that I'll be trying out. First, Injection #1 from Warren Ellis and Declan Shalvey (absolutely love Ellis' work) and second, Mythic #1 from Phil Hester and John McCrea. Tom P: In Return Of The Jedi (spoilers! ), Darth Vader looks on as his master, the delightfully evil Emperor Palpatine, gleefully electrocutes Vader's son, Luke Skywalker. What should he do? Save him or just let him go? Well Darth, I'm just as stuck with your new Marvel comic book. The first few where great but I'm becoming less convinced with every issue. A sadistic protocol droid and a plucky young weapons designer? Hardly the lone wolf I always envisioned. I will give you one more issue to decide if you stay on the pull-list or not. The same can't be said for Black Science #14, East Of West #19 and Saga #28. They have nothing to worry about - tremendous comics one and all. Injection #1 is new this week from the team that brought us the excellent Moon Knight recently. Warren Ellis seems to be back on form and even on time with his work again which makes me a happy man - he's a true master of the art form when he wants to be and the premise of this title sounds right up my street. C.O.W.L. #10 is another must read and if you haven't done so, grab the first trade like I did and catch up quick. It really delivers unlike a lot of recent Watchmen/Minutemen wannabes. I loved last week's Secret Wars so am happy to see the next issue out this quickly. As a big Hickman fan it really paid off on all the work he's put in so far. It felt like a truly bombastic end to a sprawling epic. It's even got me excited about some of the spin-off books that I may have dismissed too quickly. This may be the last Marvel event I ever let myself get sucked into so I plan to embrace it! Thor #8 rounds off the list nicely as we finally learn who she is. I've loved this run and I think it's been the best work on a Thor book since Coipel and Straczynski's run. High praise indeed after the God Butcher stuff. Russell Dauterman has been a real discovery for me and I'm upgrading this arc to a hardcover as soon as I can!